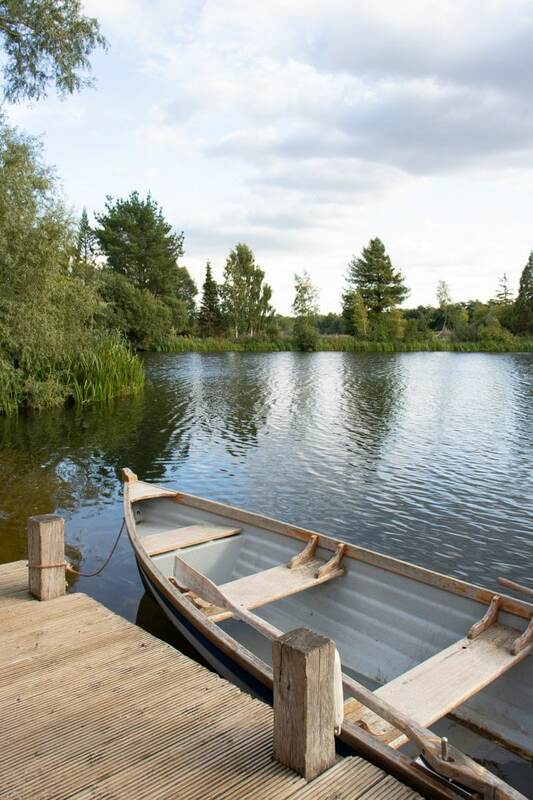 We recently spent the most peaceful and relaxing weekend at Log House Holidays in the Cotswolds, UK. 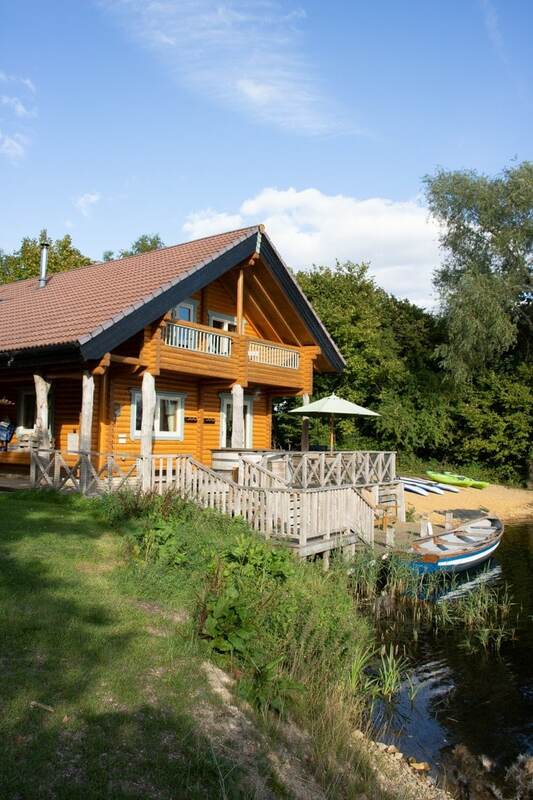 The lakeside log cabin was an unforgettable luxury break. Last weekend I was the most relaxed that I’ve been in years. I spent a few blissful days completely unwinding. 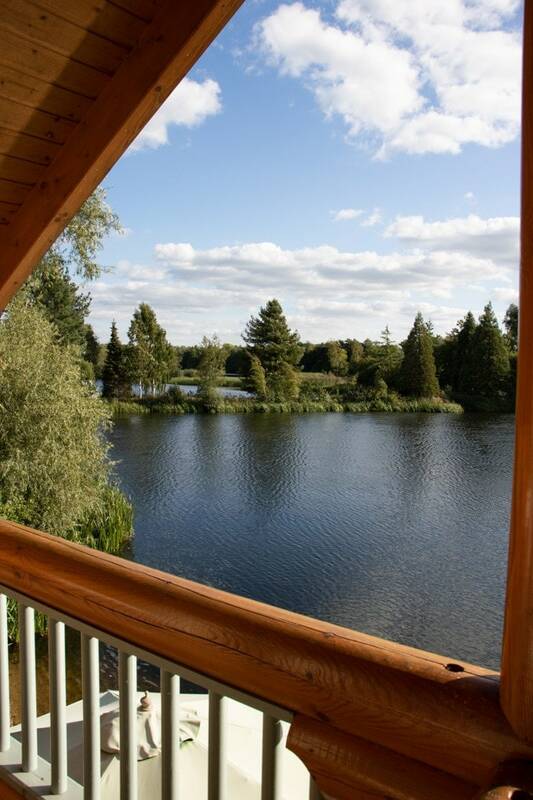 Coffee on the dock in the still of the mornings, afternoons kayaking around the lake exploring islands and evenings sat with a glass of bubbly in the hot tub stargazing. It honestly doesn’t get any better. 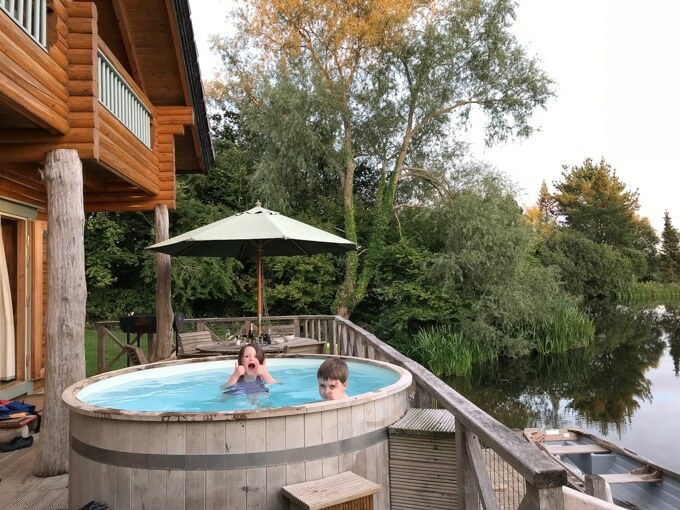 After our drive to the picturesque lakes area of the Cotswolds, we followed the signs around the large nature park to Kaiser’s Cabin – our weekend home. We were all instantly smitten by the pretty log cabin and the beautiful lake. The sun glittered across the water as we ran about exploring the luxury lodge and grounds. Log House Holidays was set up in 1980 by Anthony Edmonson at the age of 23. He he saved up for four years, while working in a silver mine in Yukon, Canada. 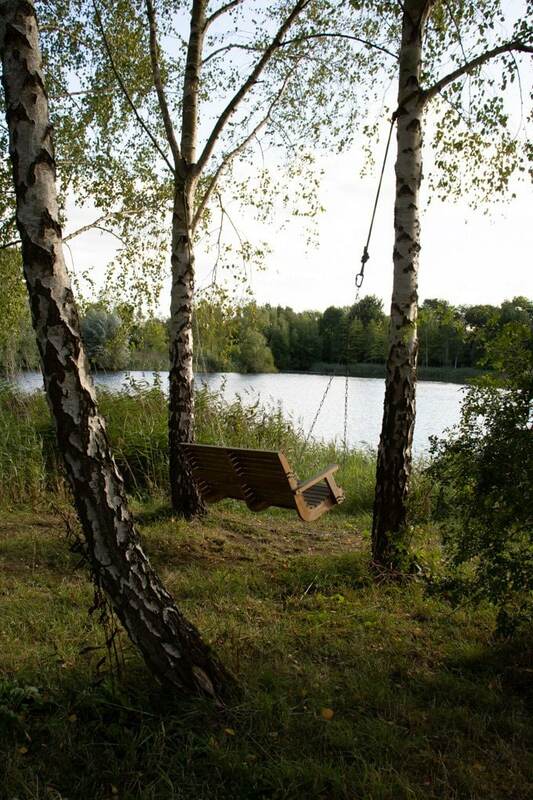 He returned to the UK and bought an old gravel pit that was nearly treeless. He planted over 50,000 trees and dramatically changed the landscape and creating habitats, and by 1991 the lake was designated a Special Site of Scientific Interest (SSSI). 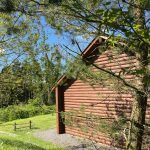 This environmentally friendly site is 130 acres with 8 luxury log cabins, all made of wood from sustainable woodland in Northern Finland. Built for Scandinavian temperatures, the cabins stay cosy in the winter and cool in the summer. 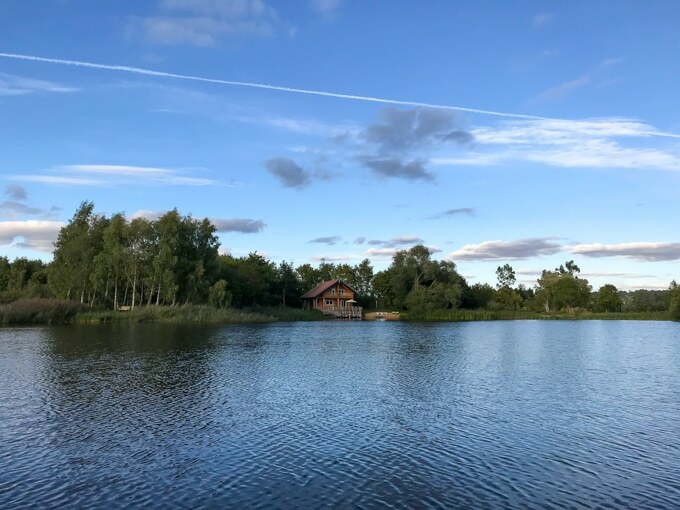 The luxurious cabins each have ground source heat pumps, harnessing power from the lake for the underfloor heating and hot tubs. Further power comes from solar panels tucked into the reed beds. Firewood is sustainably sourced from the nature reserve to maintain and develop the existing habitats and environment around the lake. 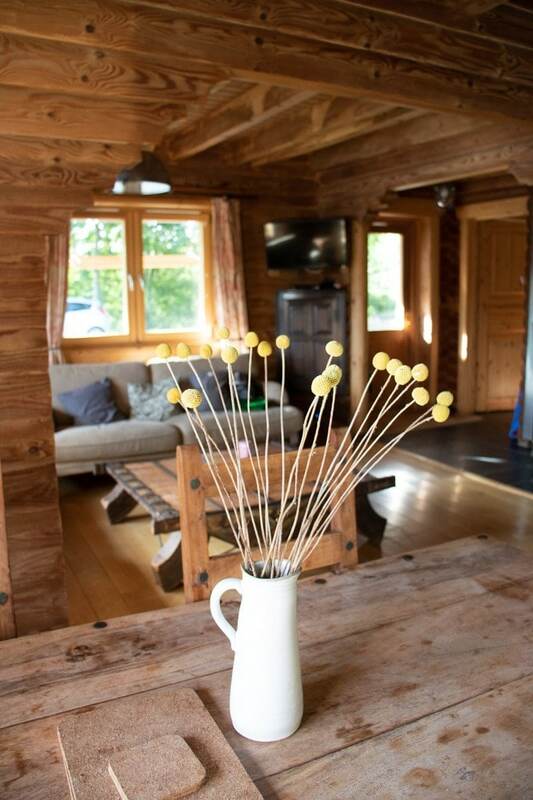 The log cabins are beautifully appointed with charming touches, luxury fixtures and fittings and all mod cons. 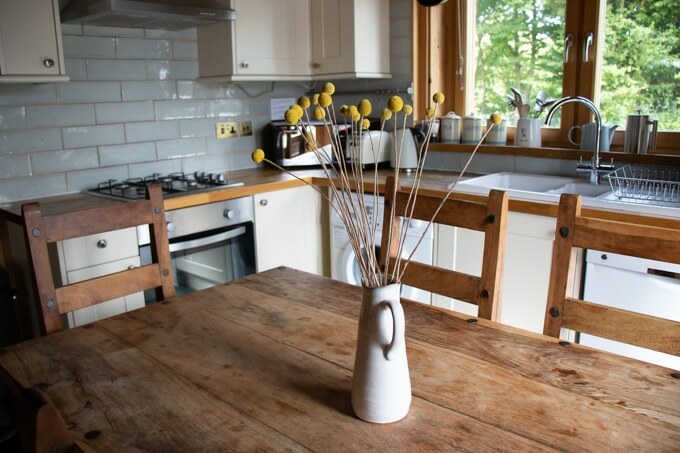 The underfloor heating is supplemented by a charming wood burning stove, the bedding is hotel quality and the kitchen is fully equipped. There are also plenty of towels and you can even hire spa bathrobes (do it!). Small hotel-style soaps are also supplied. The large open-plan living space has plenty of comfy seating, a wood burning stove, TV and a cabinet full of books, DVDs and board games. We loved playing Monopoly in front of the fire one morning. Much to my annoyance, my six year old daughter totally beat me. There’s a large downstairs wet room, where you can have a lovely high-pressure hot shower, as the log walls steam like a sauna. Also downstairs is a spacious double bedroom and the kitchen. The bright sunny kitchen looks out over the stunning lake. 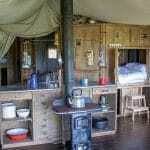 It’s fully equipped with a cooker, hob, toaster, kettle and microwave. There’s also a washing machine and dishwasher. 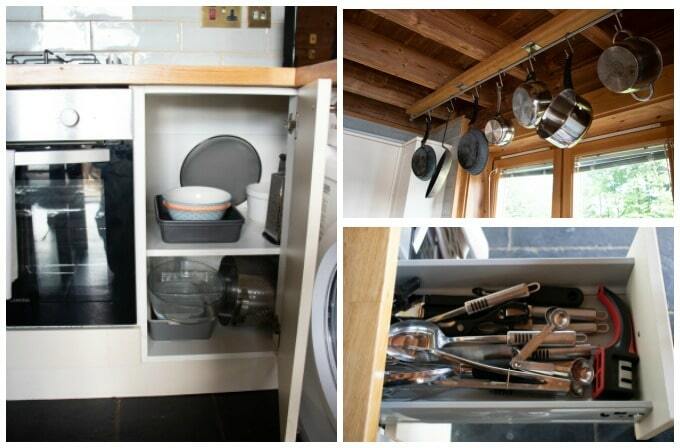 It’s fully stocked with cutlery, glassware, crockery and cooking equipment. We found it perfectly easy to cook up all of our meals from scratch. 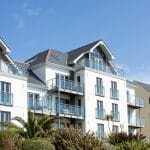 I’m always worried what to pack for the kitchen before going on self catering holidays – but you certainly don’t have to be here! There’s everything from cheese grater and veg peeler to sharp knives and measures. You could even bake a cake should you want to! A metal spiral staircase leads upstairs to the other bedrooms. The large master bedroom has a balcony with table and chairs overlooking the lake. All have comfy beds with luxurious linens. Hairdryer supplied. The main bathroom has a roll top bath with a skylight above, perfect for a nighttime soak and stargaze. Everywhere has luxurious fixtures and fittings. It’s like a log boutique hotel. On thing that really struck me is the seclusion. The eight cabins are all very spaced out. You can see them in the distance, but they’re quite far away. That means you can explore and enjoy the tranquility. You can wander out in your bathrobe in the mornings and take a dip in the hot tub in complete privacy. We occasionally saw our friendly neighbours walking dogs or cycling on the paths so it’s lovely to know you’re not alone, but each of the few cabins are tucked away in their own areas. Good for: Couples, families, groups, honeymoon, special occasions. You can walk around the lake, which is 2 miles long and takes about 30 minutes. No outdoor music means it stays peaceful for all guests. Nearest pub: The Wild Duck Inn is a 16th Century pub is 5 minutes drive away or you can cycle there. 8 cabins, sleeping 4/6/8/11. Book weekends or midweek breaks, 3, 4 or 7 nights. From £610. Kayaks – highly recommended. We took them out a few times every day and loved exploring the lake. Novices, we found them very easy to manoeuvre. The rowboat is supplied at the cabin as standard. 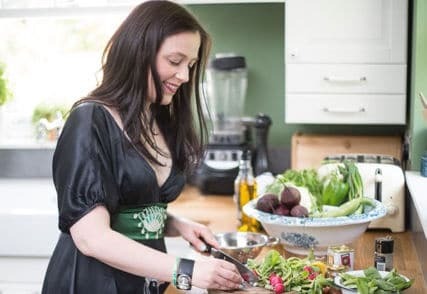 Baking courses – French trained baker Danielle Ellis runs hands-on baking classes from your log cabin. (2 hours, £100 for up to 6 people). 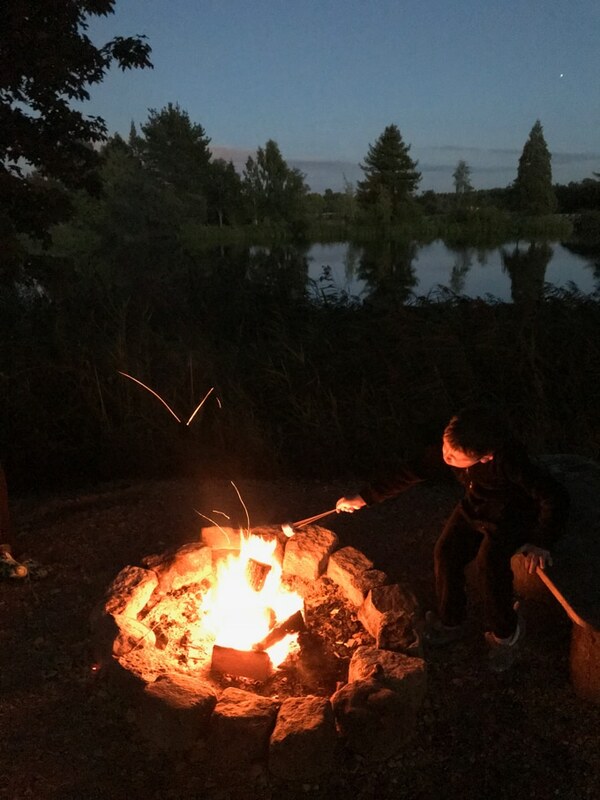 A note about how to hygge the cabin – from cosying under blankets to creating pools of light and the fire. And more, but I don’t want to spoil the surprise! Bikes (or hire them here) for spins around the lake and surrounding areas. Food and drink. The nearest large food store is in Cirencester, 4 miles away. So, what did my family really think of Log House Holidays? Honestly, we loved every single second and didn’t want to leave. We’d happily all move there in a heartbeat and be happy and content forever. I’ve never felt so relaxed. 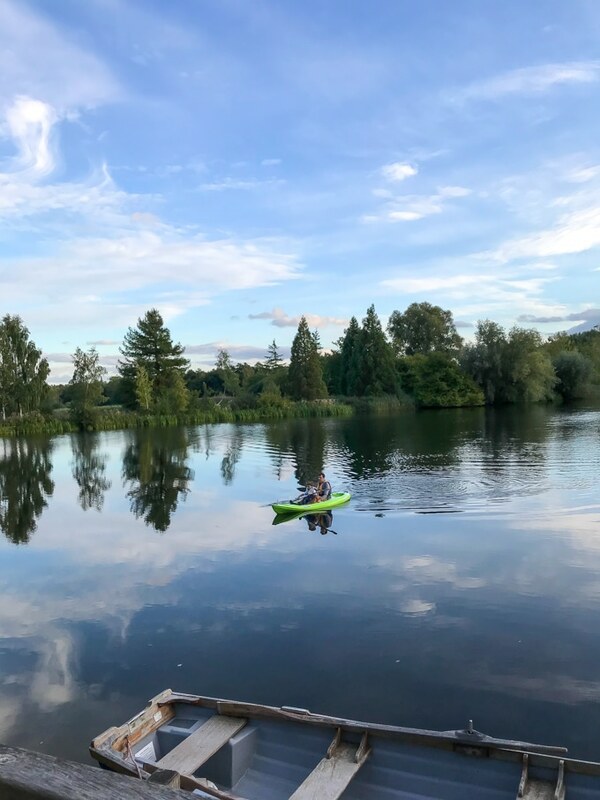 The kids had lots of free-range-freedom to explore, and we loved jumping into a boat or kayak for a wander around the lake. It’s the very best of slow living. So many memories were made in just a short weekend. Grandma looked after the kids while my husband and I raced our kayaks around the islands. We tried our hand at paddle boarding for the first time, to much laughter (mostly mine as I nearly went into the drink). There was a memorable early morning I spent sipping tea on the jetty with my young son, chatting as we watched the boat bob about and the fish jump. 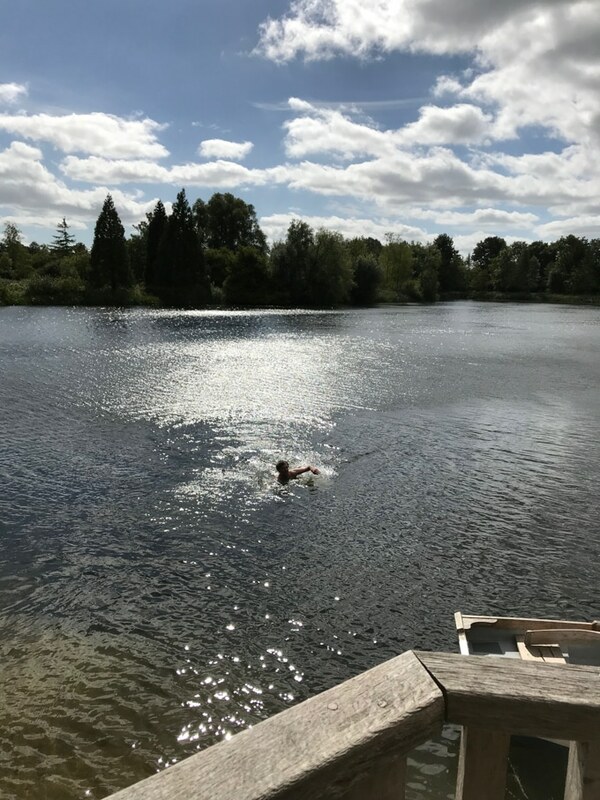 My daughter finding her bravery and running straight into the cool lake. The huge 24/7 smile on my mum’s face the whole weekend and her love of the secluded swing bench. Beautiful surroundings, wonderful company and a luxurious log cabin. Pure bliss. Before we even left we were discussing when we could come back: special birthdays, anniversary… I wouldn’t hesitate to recommend this place to anyone. 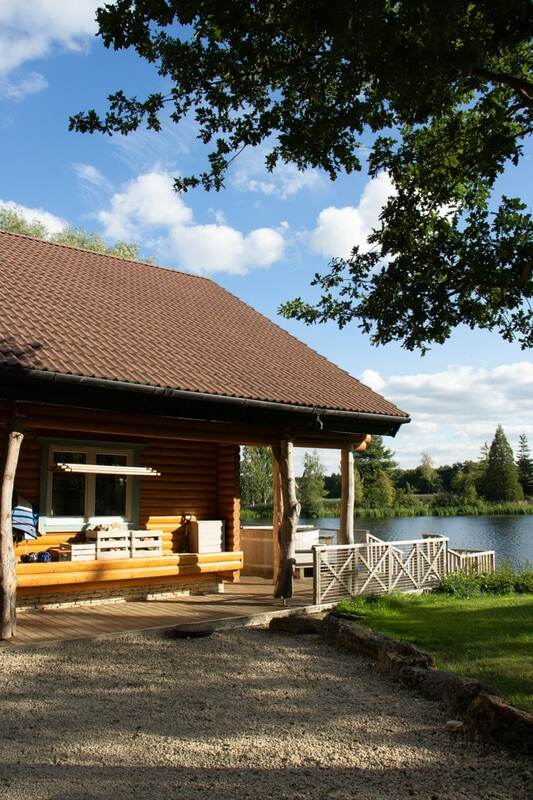 Follow #loghouseholidays on social media to see more about this incredible lakeside log house holiday park. 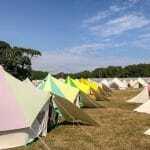 Check out my other short break reviews, including Bluestone Wales and Featherdown Farms. Disclosure: We were guests of Log House Holidays for the purpose of this review. All opinions are our own. I absolutely love the sound of this. 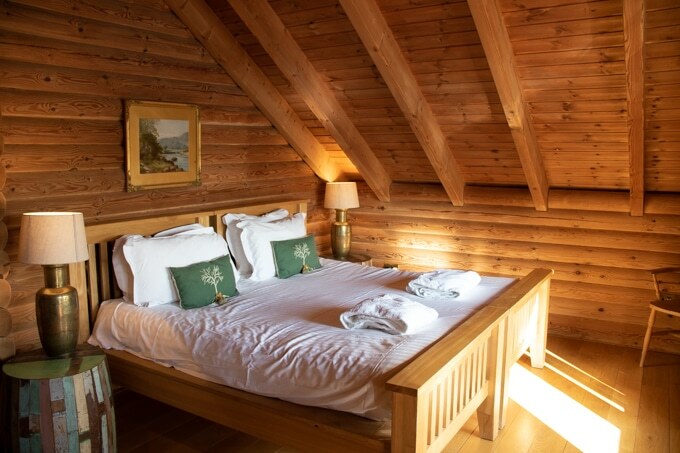 Having stayed in quite a few across Europe, I like to consider myself a bit of a log cabin expert and they look gorgeous and pretty authentic to me! I also love the back story of how the owner saved and bought the land. Brilliant! What a fabulous holiday this was and the cabin log houses look so cosy and the view absolutely stunning! I am also in love with their kitchen. Book marking this for when we head to Cotswolds. What a stunning cabin – looks perfect for a long, relaxing weekend away! This looks like the most amazing place to stay – Steve and I have been together for 10 years next April and I have been looking for somewhere just like this to celebrate so will definitely be checking it out. The Cotswolds is an absolutely beautiful place isn’t it! This seems like such a gorgeous place to stay – I love how it leads down the water, I’m not sure I would ever want to leave! That looks absolutely amazing, and I definitely think I’d have to pay extra to use the hot tub. Oh my goodness, what an absolutely stunning place. This would be so perfect for a special couples retreat or honeymoon. Absolutely beautiful cabins and scenery. I love the Cotswolds, what a fantastic place for a trip. The cabin looks beautiful – really stunning and the attention to detail is amazing. In awe of the hot tub too, fab!